Use the tracking scenario generator to create ground truth for all moving and stationary radar platforms and all target platforms (planes, ships, cars, drones). The trackingScenario class models the motion of all platforms in a global coordinate system called scenario coordinates. These objects can represent ships, ground vehicles, airframes, or any object that the radar detects. See Orientation, Position, and Coordinate Systems for a discussion of coordinate systems. Optionally, simulate an inertial navigation system (INS) that provides radar sensor platform position, velocity, and orientation relative to scenario coordinates. Create models for each radar sensor with specifications and parameters using the monostaticRadarSensor, radarSensor, or radarEmitter objects. Using target platform pose and profile information, generate synthetic radar detections for each radar-target combination. Methods belonging to trackingScenario retrieve the pose and profile of any target platform. The trackingScenario generator does not have knowledge of scenario coordinates. It knows the relative positions of the target platforms with respect to the body platform of the radar. Therefore, the detector can only generate detections relative to the radar location and orientation. If there is an INS attached to a radar platform, then the radar can transform detections to the scenario coordinate system. The INS allows multiple radars to report detections in a common coordinate system. 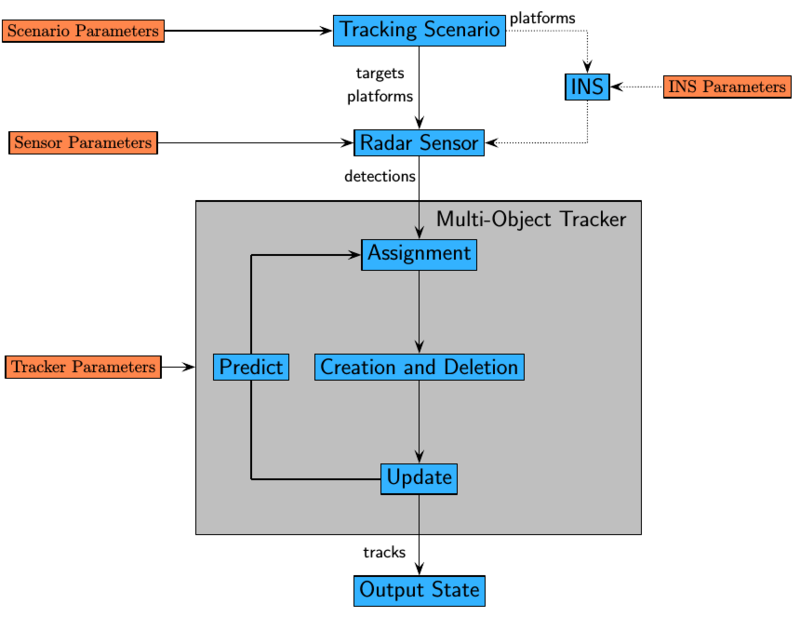 Process radar detections with a multi-object tracker to associate detections to existing tracks or create tracks. Multi-object tracks include trackerGNN, trackerTOMHT, trackerJPDA and trackerPHD. If there is no INS, the tracker can only generate tracks specific to one radar. If an INS is present, the tracker can create tracks using measurements from all radars. The flow diagram shows the progression of information in a tracking simulation.